Hair transplantation is a surgical procedure used to treat baldness or hair loss (alopecia). Typically, tiny patches of scalp are removed from the back and sides of the head and implanted in the bald spots in the front and top of the head. Hair transplantation is a cosmetic procedure performed on men and occasionally on women who have significant hair loss, thinning hair, or bald spots where hair no longer grows. In men, hair loss and baldness are most commonly due to genetic factors and age. Male pattern baldness, in which the hairline gradually recedes to expose more and more of the forehead, is the most common form. Men may also experience a gradual thinning of hair at the crown, or very top of the skull. For women, hair loss is more commonly due to hormonal changes and is more likely to be a thinning of hair from the entire head. Transplants can also be performed to replace hair lost due to burns, injury, or diseases of the scalp. An estimated 50,000 men receive hair transplants each year. Hair transplantation surgery is performed by a physician with specialty training in plastic surgery or, less commonly, dermatology. Each surgery lasts two to three hours during which approximately 250 grafts will be transplanted. A moderately balding man may require up to 1,000 grafts to get good coverage of a bald area; consequently, a series of surgeries scheduled three to four months apart is usually required. Individuals may be completely awake during the procedure with just a local anesthetic drug applied to numb the areas of the scalp. Some persons may be given a drug to help them relax or may be given an anesthetic drug that puts them to sleep. The most common transplant procedure uses a thin strip of hair and scalp from the back of the head. This strip is cut into smaller clumps of five or six hairs. Tiny slits are made in the balding area of the scalp, and a clump is implanted into each slit. The doctor performing the surgery will attempt to recreate a natural-looking hairline along the forehead. Minigrafts, micrografts, or implants of single hair follicles can be used to fill in between larger implant sites and can provide a more natural-looking hairline. The implants will also be arranged so that thick and thin hairs are interspersed and the hair will grow in the same direction. Another type of hair replacement surgery is called scalp reduction. This involves removing some of the skin from the hairless area and "stretching" some of the nearby hair-covered scalp over the cut-away area. may pay for hair replacement surgery to correct hair loss due to accidents, burns, or disease. It is important to be realistic about what the final result of a hair transplant will look like. This procedure does not create new hair. Rather, it simply redistributes the hair that an individual still has. Chest hair has been experimentally transplanted onto the scalp. As of 2003, this procedure has not been widely used. Although hair transplantation is a fairly simple procedure, some risks are associated with any surgery. It is important to inform the physician about any medications currently being used and about previous allergic reactions to drugs or anesthetic agents. People with blood-clotting disorders also need to inform their physician before the procedure is performed. It is important to find a respected, well-established, experienced surgeon and discuss the expected results prior to the surgery. The candidate may need blood tests to check for bleeding or clotting problems and is usually asked not to take aspirin products before the surgery. The type of anesthesia used will depend on how extensive the surgery will be and the setting in which it will be performed. The candidate may be awake during the procedure, but is usually given medication to cause relaxation. A local anesthetic drug that numbs the area will be applied or injected into the skin at the surgery sites. The areas involved in transplantation may need to be bandaged overnight. People can return to normal activities within a day. Strenuous activities should be avoided in the first few days after the surgery. On rare occasions, the implants can be ejected from the scalp during vigorous exercise . There may be some swelling, bruising, headache, and discomfort around the graft areas and around the eyes. These symptoms can usually be controlled with a mild pain reliever such as aspirin. Scabs may form at the graft sites and should not be scraped off. There may be some numbness at the sites, but it will diminish within two to three months. Although there are rare cases of infection or scarring, the major risk is that the grafted area might not look the way the patient expected it to look. The transplanted hair will fall out within a few weeks; however, new hair will start to grow in the graft sites within about three months. A normal rate of hair growth is about 0.25–0.5 in (6–13 mm) per month. Major complications as a result of hair transplantation are extremely rare. Occasionally, a person may have problems with delayed healing, infection, scarring, or rejection of the graft; but these are uncommon. There are several alternatives to hair transplantation. The two most common include lotions containing drugs and wigs. As of 2003, only lotions containing Minoxidil or Finasteride actually grow any new hair. This does not occur for all users. The new hair Minoxidil grows is usually only a light fuzz on the crown of the head. When Minoxidil treatment is discontinued, the fuzz disappears, in addition to any hairs that were supposed to die during treatment. In some cases, Finasteride does grow thick, strong, long-growing hair on the crown. Wigs and hairpieces have been used for centuries. They are available in a wide price range, the more expensive ones providing more realistic appearance than less expensive models. See also Plastic, reconstructive, and cosmetic surgery . Buchwach, K. A., and R. J. Konior. 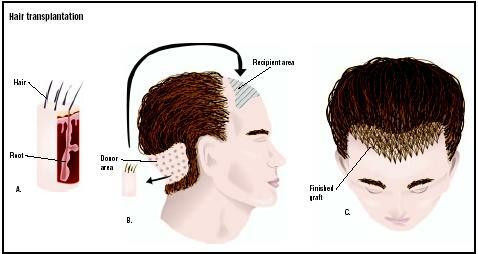 Contemporary Hair Transplant Surgery. New York: Thieme, 1997. Man, Daniel and L. C. Faye. New Art of Man: Faces of Plastic Surgery: Your Guide to the Latest Cosmetic Surgery Procedures, 3rd edition. New York: BeautyArt Press, 2003. Maritt, Emanual. Hair Replacement Revolution: A Consumer's Guide to Effective Hair Replacement Techniques. Garden City Park, NY: Square One Publishers, 2001. Bernstein, R. M., W. R. Rassman, N. Rashid, and R. C. Shiell. "The Art of Repair in Surgical Hair Restoration—Part I: Basic Repair Strategies." Dermatologic Surgery, 28(9) 2002: 783–794. Bernstein, R. M., W. R. Rassman, N. Rashid, and R. C. Shiell. "The Art of Repair in Surgical Hair Restoration—Part II: The Tactics of Repair." Dermatolical Surgery, 28(10) 2002: 873–893. Epstein, J. S. "Hair Transplantation in Women: Treating Female Pattern Baldness and Repairing Distortion and Scarring from Prior Cosmetic Surgery." Archives of Facial Plastic Surgery, 5(1) 2003: 121–126. Epstein, J. S. "Hair Transplantation for Men with Advanced Degrees of Hair Loss." Plastic and Reconstructive Surgery, 111(1) 2003: 414–421. Swinehart, J. M. "Local Anesthesia in Hair Transplant Surgery." Dermatolical Surgery, 28(12) 2002: 1189–1190. American Academy of Cosmetic Surgery. 401 N. Michigan Ave., Chicago, IL 60611-4267. (313) 527-6713. http://www.cosmeticsurgeryonline.com . American Academy of Dermatology. 930 N. Meacham Road, P.O. Box 4014, Schaumburg, IL 60168-4014. (847) 330-0230, Fax: (847) 330-0050. http://www.aad.org/ . American Academy of Facial Plastic and Reconstructive Surgery. 1110 Vermont Avenue NW, Suite 220, Washington, DC 20005. (800) 332-3223. Columbia University College of Physicians and Surgeons [cited March 23, 2003]. http://cpmcnet.columbia.edu/dept/derm/hairloss/ . CosmeticSurgeryFYI.com [cited March 23, 2003]. http://www.cosmeticsurgeryfyi.com/surgeries/hair_transplantation.html . How Stuff Works [March 23, 2003]. http://people.howstuffworks.com/hair-replacement6.htm . University of Washington School of Medicine [cited March 23, 2003]. http://faculty.washington.edu/danberg/bergweb/page3.htm . Hair transplantation is performed by a physician with specialty training in plastic and cosmetic surgery or dermatology. It maybe performed in a professional office, outpatient, or hospital setting. Is the doctor board certified in plastic and reconstructive surgery or dermatology? How many hair transplantation procedures has the doctor performed? What is the doctor's complication rate? m 27 yrs male i didn't have completly baldness but the hair from crown area front i want to know that how may graft will i need but can u do one favour on me plz send me any of ur client before and after pic who has transplanted 1500 to 2000 graft . so that i will match with my self and i will arange for such . here it is not possible to send because or downloading problem..
my hair are thin what kind of treatment is sutable for me.